All too often overshadowed by the magnificence of the Hassan II Mosque, the Notre Dame de Lourdes Cathedral is an important center of worship for Morocco’s Roman Catholic population and serves as a striking example of Casablanca’s modern architecture. 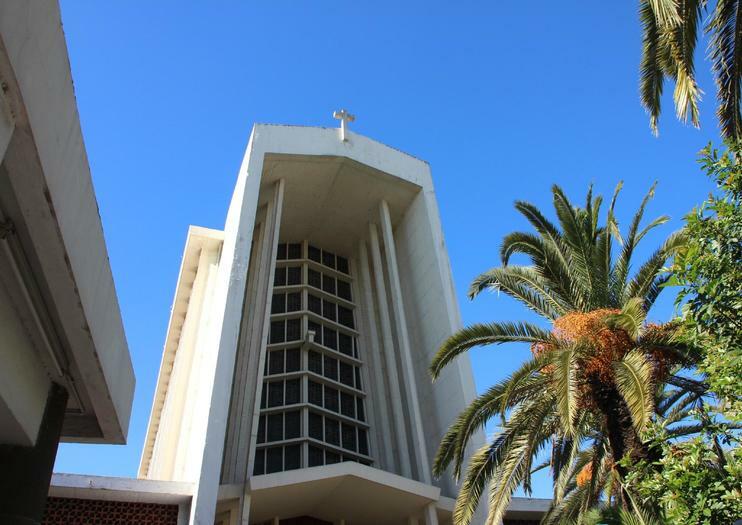 Built in 1954 by architect Achille Dangleterre, the cathedral’s imposing white concrete façade looks more like a warehouse than a church and a simple white cross is the only hint to its purpose. Step inside however, and the cathedral’s popularity becomes obvious – a dazzling kaleidoscope of floor-to-ceiling stained glass windows. Painstakingly crafted by French glassmaker Gabriel Loire, the masterpiece includes an incredible 800 square meters of glass and many visitors to the church come solely to admire its artistry. The Notre Dame de Lourdes Cathedral is located just northwest of the Habous Quarter in central Casablanca and is open daily. Entrance is free. Discover Casablanca’s atmospheric center and top sites on a full-day, private tour from Marrakech, and explore the seaside city with a personal guide. You’ll stroll the narrow lanes of the Habous district, see the imposing gates of the Royal Palace of Casablanca, then enjoy sea breezes in the historic neighborhood of Anfa. This 10-hour Casablanca tour includes round-trip transport from Marrakech by private vehicle, with pickup and drop-off at your hotel.